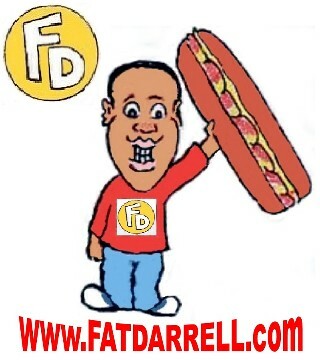 August 2018 – #DoubleFML FatDarrellPalooza! Well, I tried. This restaurant, The Varsity, held it’s 90th anniversary party on Saturday. Since they were established near the Georgia Tech campus back in 1928 and are the world’s largest drive-in restaurant, they’re an Atlanta institution! I’ve heard a lot about this place so eating there is on my official “Georgia Bucket List” of… Continue reading Varsity Blues: Peachy…just peachy. Living the Dream: You Don’t Know Jackfruit! Well, “The Black Forest Gump” has done it again. Huh? That’s what one of my friends called me after I ended up dancing onstage with Salt-N-Pepa several weeks ago. If you’ve never seen the movie Forest Gump, first off…how? But okay, if you’ve never seen the movie Forest Gump, Tom Hank’s titular (<-lol… Continue reading Living the Dream: You Don’t Know Jackfruit! Surprisingly, I don’t have a banana hat or costume already on-hand in “Darrell’s magical storage closet of randomness” so I had to come up with something else for the cover photos. I’m sure the costume shop downtown has one, but this topic was a last-minute decision, so I don’t have time to make… Continue reading This ISH Is Bananas!